Can Commercial Districts play the Social Media game? It is not uncommon to see social media handled poorly by business improvement district organizations. I follow lots of twitter accounts and facebook pages, and I often see posts related to the organization or staff, but little that might compel customer visits…the real reason the organization is in business to begin with! When using social media, it’s always helpful to remember exactly who your audience is and what value add you are offering them. Your twitter feed should not be about promoting your work (like anything, there are some exceptions of course), it should primarily be about promoting the businesses and the activities you sponsor that are intended to drive visitation to your district. There is a fine distinction here that makes all the difference. As many of you know, I often look to what the Shopping Center Industry is doing to cull ideas. The way I see it, if Shopping Centers spend their resources testing ideas to attract shoppers to their stores – we might as well learn something from it and save the hassle of having to reinvent the wheel. To that end, the August issue of Shopping Centers Today had a great feature on the changing role of social media and offered two innovative ways that shopping centers have leveraged “followers” online…see below and enjoy! The Miracle Mile Shops in Las Vegas hosts “Follow Fridays,” during which the Twitter profiles six randomly chosen followers of the Miracle Mile’s Twitter handle are displayed on the mall’s LED screens on the Las Vegas Strip. Every Friday, @MiracleMileLV sees an increase in Twitter followers inspired by the opportunity to see their name on the big screen. In less than a year since its inception, the “Follow Friday” campaign has helped the Miracle Mile shops gain 64% more Twitter followers and 51% more Facebook fans. 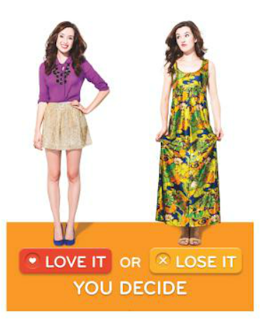 Vancouver mall Metropolis at Metrotown’s “Love It or Lose It” campaign encourage people to upload pictures of themselves in different outfits to the mall’s Facebook page, where other fans could vote on which people’s outfits they like best—and worst. At the end of the four-week campaign, users with the most “love it” votes received mall gift cards for a shopping spree, while users with the most “lose it” votes also received mall gift cards for a shopping spree—and a free hair makeover and style consultation. Shoppers were not the only winners—Metropolis at Metrotown’s Facebook page drew 10,500 visits, 41,000 page views, and the fan base grew by 17%. Summer Associate Nicole Leighton contributed to this article.